Let’s face it, one of the challenges of wearable electronics is that people are filthy. Anything you wear is going to get dirty. If it touches you, it is going to get sweat and oil and who knows what else? And on the other side it’s going to get spills and dirt and all sorts of things we don’t want to think about on it. For regular clothes, that’s not a problem, you just pop them in the washer, but you can’t say the same for wearable electronics. Now researchers at MIT have embedded diodes like LEDs and photodetectors, into a soft fabric that is washable. Traditionally, fibers start as a larger preform that is drawn into the fiber while heated. The researchers added tiny diodes and very tiny copper wires to the preform. As the preform is drawn, the fiber’s polymer keeps the solid materials connected and in the center. The polymer protects the electronics from water and the team was able to successfully launder fabric made with these fibers ten times. Finding a killer application for e-textiles is the realm of the hacker and within that realm, anything goes. Whether it’s protecting your digital privacy with signal shielding, generating audio with a wearable BeagleBone or 555 timer, or making your favorite garment into an antenna, the eTextile Spring Break is testing out ways to combine electronics and fabric. You may be asking yourself “What are e-textiles good for?”. Well, that’s an excellent question and likely the most common one facing the industry today. I’m afraid I won’t be able to give a definitive answer. As an e-textile practitioner, I too am constantly posing this question to myself. There’s an inherently personal nature to fabric worn on the body and to our electronic devices that makes this answer elusive. Instead of trying to fabricate some narrow definition, what I offer is a look at topics of interest, material experimentation, and technical exploration through the lens of a week-long event held recently in New York called eTextile Spring Break. The practice of developing wearable electronics offers a lot of opportunity for new connector designs and techniques for embedding electronics. Questions like these will eventually come up: How will this PCB attach to that conductive fabric circuit reliably? What’s the best way to transition from wire to this woven conductive trim? What’s the best way to integrate this light element into this garment while still maintaining flexibility? Mika Satomi and Hannah-Perner Wilson of Kobakant are innovators in this arena and inspire many with their prolific documentation while they ask themselves questions similar to these. Their work is always geared towards accessibility and the ability to recreate what they have designed. Their most recent documented connector is one they call the Bumblebee Breakout. It connects an SMD addressable RGB LED, such as Adafruit’s Neopixel, to a piece of side glow fiber optic 1.5mm in diameter. On a short piece of tubing, the four pads of the SMD LED are broken out into four copper rings giving it the look of a striped bumblebee. To keep from shorts occurring while wrapping the copper tape contacts around the tube, they use Kapton tape to isolate each layer as they go. This connector was originally created to be used in a commission they did out of Koba, their e-textile tailor shop located in Berlin. Fiber optics were applied to jackets for a performance called “All Your Base Are Belong To Us” produced by the Puppetry Department of the Hochschule für Schauspielkunst Ernst Busch. 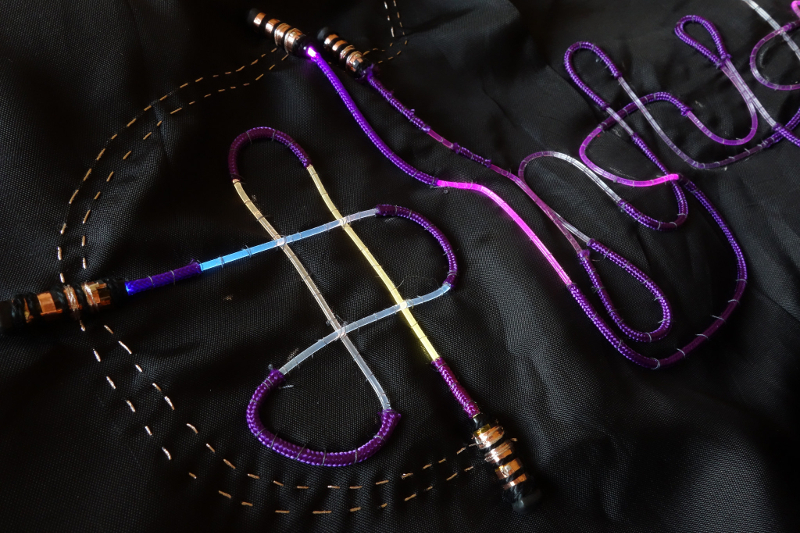 Peruse more e-textiles techniques and learn how to build a connector transitioning from an embroidered thread bus to a wire and how to knit solderable circuit boards. And make sure to click around Kobakant’s website, it’s full of e-textile DIY tutorials! [Admar] is a software developer who was introduced to e-textiles in 2011. The bug firmly took hold, and these days he gives e-textile workshops at Eindhoven University of Technology. Here, students learn to build a single e-textile sensor that detects both presence and pressure. The workshop presentations are available on his site, which is itself a window into his e-textile journey. 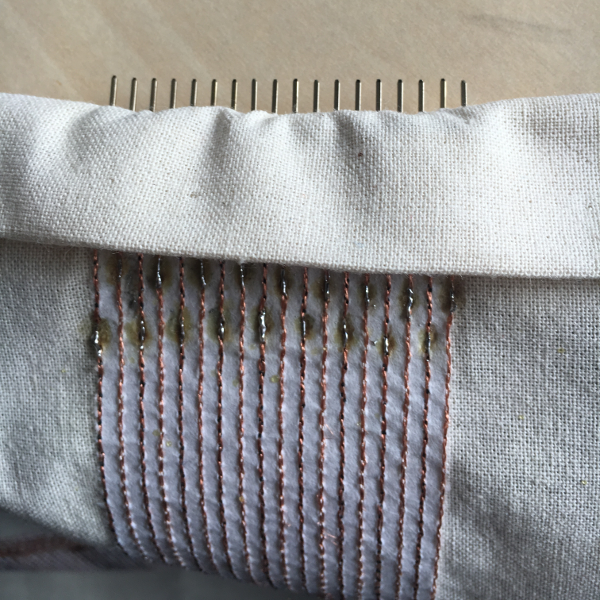 Over the years, [Admar] has discovered that any e-textile project requiring more than a few connections is ripe for some kind of textile-friendly multi-point connector. Through trial and error, he designed a robust solution for use with an embroidery machine. The wires are made from conductive thread and soldered to a row of male header pins to make the transition out of fiber space. This transition requires solder, which quickly gets interesting when coupled with a fabric substrate and no solder mask. We wonder if spraying on mask beforehand would help, or if it would just soak in and stain and get in the way. You can see the connector in practice in [Admar]’s capacitive multi-touch demo video after the break. He has stacked two pieces of fabric, each with a wire bus made of conductive threads, with the traces at right angles. Both sensors are wired to a Cypress PSoC5 to create a sensor matrix, and then to a laptop for visualization purposes. As his fingers approaches the fabric, the bar graphs roar upward to show increased capacitance. Once he makes contact, each finger appears as a yellow dot illustrating pressure. E-textile projects aren’t limited to traces sewn by hand or embroidery machine. Circuit boards can be knitted, too. Is That Google In Your Pants? Google’s Project Jacquard is tackling the age old gap between controlling your electronic device and touching yourself. They are doing this by weaving conductive thread into clothing in the form of a touch pad. In partnership with Levi Strauss & Co., Google has been designing and producing touch interfaces that are meant to be used by developers however they see fit. The approach that Project Jacquard has taken from a hardware standpoint is on point. Rather than having an end user product in mind and design completely towards that goal, the project is focused on the interface as its product. This has the added benefit of endless varieties of textile interface possibilities. As stated in the video embedded after the break, the conductive touch interface can be designed as a visibly noticeable difference in material or seamlessly woven into a garment. Can an unintentional brush with another person “sleeve dial” your boss or mother-in-law? What are the implications of Google putting sensors in your jeans? At what point is haptic feedback inappropriate? and do we have to pay extra for that? We’ve covered e-textiles before from a conductive thread and thru hole components approach to electro-mechanical implementations. The chill of autumn is upon us, and with it comes the awkward sport of trying to work touch-sensitive phones and gadgets with gloved fingers. One can try toughing it out with fingerless gloves, or we’ve seen some costly solutions in the forms of specialized gloves and capacitive-compatible styluses, but sometimes simple is best: all it takes is a few stitches of conductive thread in the fingertips. Conductive thread is available from various sources; SparkFun Electronics comes naturally to mind, but most vendors carrying the LilyPad Arduino will stock a suitable thread as well. Don’t fret if you’ve never sewn before — just a few simple loops are required, and it doesn’t need to be especially tidy. In principle this should work for trackpads and capacitive mice as well, if you use those in the field. For multitouch devices, add a separate conductive bit to each fingertip.